Sweetwater by Del Webb is an active adult community in Jacksonville, Florida. It is conveniently located near Interstates, downtown Jacksonville, and the airport. Homebuyers can choose from a variety of reasonably priced housing options while enjoying an active lifestyle and plenty of great amenities. This 55+ community was developed between 2005 and 2016 and has 950 residences. For the area, this age-restricted neighborhood has relatively low homeowner's insurance rates. It is a dog-friendly active adult community with an abundance of wildlife and lush landscapes. At the heart of Sweetwater is Summerland Hall, a magnificent 22,000 square-foot clubhouse hosting a variety of world-class amenities and exercise options. A large, state-of-the-art fitness center and a movement studio invite residents to stay in shape while working out in stylish surroundings. An indoor lap pool with a separate heated hot tub pampers residents after a workout, while a very large outdoor resort-style pool invites residents outside to refresh in the glorious Florida sunshine. Four hobby and game rooms, which include separate areas for cards and arts and crafts enthusiasts, keep the residents up on their crafty skills. A large ballroom hosts a variety of meetings, parties and dinner events. The business center with a library provides a welcome escape where residents can get lost in a good book or surf the Internet. For outdoor amenities, residents can enjoy some friendly competition by utilizing tennis facilities, and bocce ball courts. There are a variety of housing styles in Del Webb's Sweetwater. Homebuyers can select from resale single-family homes, mid-rise condos, villas, and carriage homes. All buildings are of cinder block construction with stucco overlay. 25-year architectural roofs and hurricane shutters are standard features in the community. Most homes include a desirable assortment of high-end finishes such as gourmet kitchens with 42" cabinets, crown molding, Corian counters, separate inside laundry rooms and tile flooring. Del Webb has completed construction of all single-family homes, condos, villas, and carriage homes, and there is a wide variety of resale homes available for sale. The single-family homes range in size from 1,515 to 2,368 square feet. Residents have a choice of five separate floor plans, including one and two-story models. All single-family homes come with main-floor master bedrooms, covered lanais and two-car garages. The low-maintenance single-family homes also have the lowest monthly association fees in Sweetwater. This 55+ community also includes several four-story condominium buildings with an elevator. The condos have the same kitchen amenities as the single-family homes, with three different floor plans available. The condos range from 1,818 to 2,129 square feet in size. Carriage Homes are another desirable option for buyers who want to enjoy low cost living in Sweetwater. Carriage Homes are two-story buildings that include either first or second-floor living. The models of the Carriage Homes each feature a one-car garage. They offer 1,438 to 1,857 square feet of living space with two bedrooms, two bathrooms, a den, and an attached one-car garage. Villas are attached one-story homes that offer 1,363 to 1,494 square feet of living space with two bedrooms, two bathrooms, a den, and an attached two-car garage. Sweetwater in Jacksonville is home to very friendly residents, not just from all walks of life, but from all around the world. 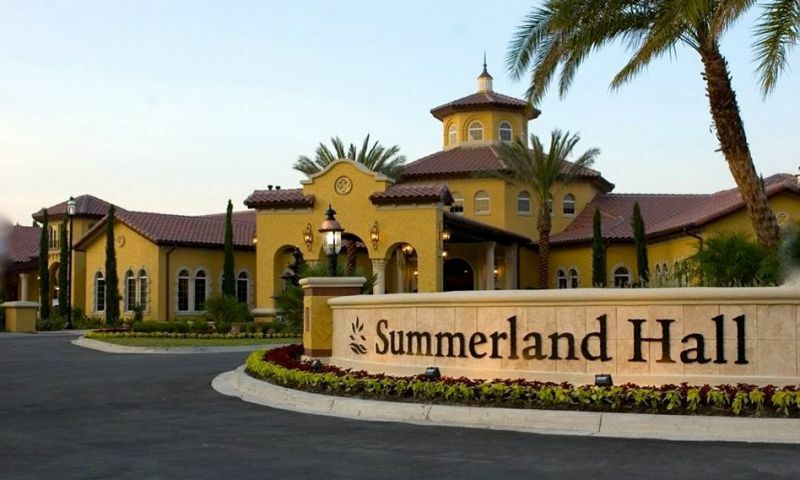 The active and energizing lifestyle centers primarily around Summerland Hall. A full-time activity director is continually putting on spectacular special events, gatherings, group outings, and resident activities. For private, leisurely enjoyment of the Florida sun, walking and biking trails allow for quiet reflections and contemplation in park-like areas. If residents want to be more involved, they can meet up in social and activity clubs such as golf, computers, poker, bible study, weight watchers, sewing, genealogy, dance, and many others. Just outside of Sweetwater in Jacksonville, Route 9A, I-95, and I-10 connect its residents to shopping, nightlife and entertainment. St. Johns Town Center, a nearby shopping center, is only five minutes away. Downtown Jacksonville at a mere 15 minute driving distance offers great sporting events, live theaters, and concerts. Top-rated Mayo Clinic is only ten minutes away, and the beach is only eleven miles from the entry gate. For farther travel, Jacksonville International Airport is 30 minutes away. For history buffs, St. Augustine and Fernandina make for wonderful day trips. An hour's drive away, residents can enjoy one of the most prestigious NASCAR events, the Daytona 500. If that is still not enough excitement, for another 45 minutes, residents can wear the grandkids out in Orlando with its great assortment of theme parks. Active adults can enjoy living in beautiful homes with plenty of amenities and attractions nearby in Sweetwater in Jacksonville, Florida. Summerland Hall - 22,000 Sq. Ft. There are plenty of activities available in Sweetwater. Here is a sample of some of the clubs, activities and classes offered here. Condos are offered on a resale-only basis with 1,810 or 2,129 square feet of living space. Each model offers two bedrooms, two bathrooms with lot parking. These attached villas offer one-story living with a two-car garage. They are available as new construction or resale and feature 1,363 to 1,494 square feet of living space with two bedrooms and two bathrooms. Carriage Homes are offered on a resale-only basis. These attached homes range from 1,438 to 1,857 square feet of living space. They have two bedrooms, a den, two bathrooms, and an attached one-car garage. Single-family homes range from 1,515 to 2,618 square feet of living space with two to four bedrooms, two to three bathrooms, and an attached two-car garage. These great low-maintenance homes offer eat-in kitchens and private master suites. Homes are available on a resale-only basis only. We moved to Sweetwater 4 months ago, and we are loving life here! So much to do if you want to, but peace and quiet when you want it. This is the perfect place to enjoy an active lifestyle in retirement. Check it out, you won't regret it! The adult community lifestyle and amenities makes for enjoyable living for those people over 55 years of age. I have joined several groups and have found my retirement years to be rewarding and busy. Sweetwater is wonderful! My husband and I have lived here for nearly 2 years and are still impressed with the community and everything it offers. The architecture of the clubhouse is beautiful and the landscaping is meticulous. Our condo is right on the water and is perfect for the two of us! We frequent the clubhouse and are very active in lots of different clubs. Del Webb really outdid themselves with this community! We wanted a Del Webb community and on our first visit here we were sold. It's perfect! 55places.com is not affiliated with the developer(s) or homeowners association of Sweetwater. The information you submit is distributed to a 55places.com Partner Agent, who is a licensed real estate agent. The information regarding Sweetwater has not been verified or approved by the developer or homeowners association. Please verify all information prior to purchasing. 55places.com is not responsible for any errors regarding the information displayed on this website.